Disclaimer: The beyerdynamic Amiron Wireless headphones were sent to us in exchange for our honest opinion. Thank you to beyerdynamic for giving us this opportunity. 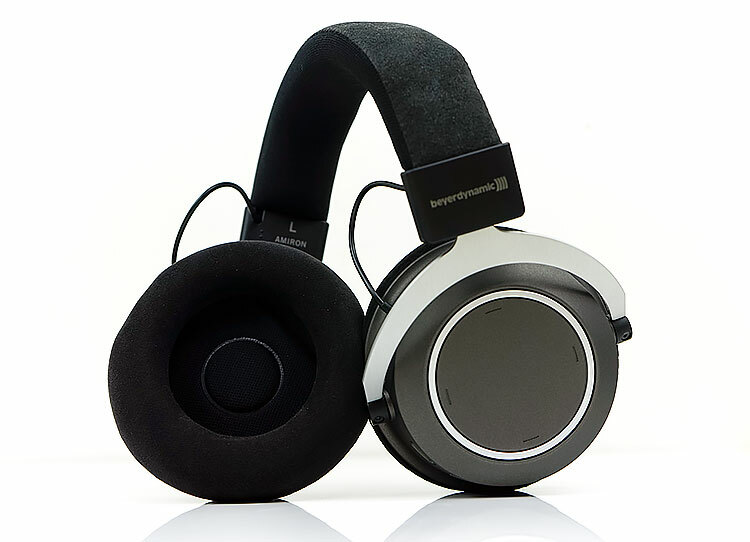 You can read more about beyerdynamic product reviews on Headfonics here. The wired Amiron Home from beyerdynamic scored fairly well last year in our review. This was a mildly v-shaped sounding open back full-sized headphone with a slightly peaky top-end but nothing off-putting. Overall, a fairly relaxing listening experience for a Tesla driver. I was not expecting a wireless version of the Amiron a year later if truth be told. Least of all an aptX-HD capable full-size closed version with touchy-feely cup plates that house a ton of instant controls. I am aware that beyerdynamic have been pushing their cheaper wireless Aventho with positive feedback. 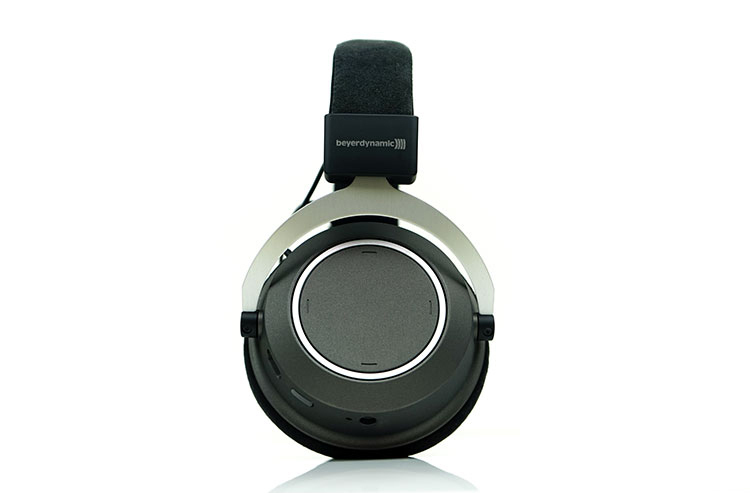 At €699.00, the Amiron Wireless is pretty much beyerdynamic going full on with wireless and as such this is their flagship wireless headphone as of now. It is also quite possibly the best sounding but most expensive Bluetooth headphone I have heard to date. 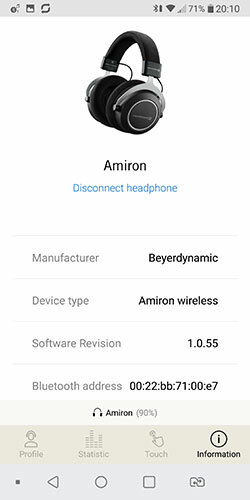 The Amiron Wireless is part of a wider vision by beyerdynamic’s on Bluetooth connectivity and not a random headphone with BT tagged on. Alongside the Aventho and the Xelento, the Amiron constitutes their “high-end” pitch to audiophiles looking for quality BT audio on the go. All three are based on existing well-received headphones and IEMs with the Aventho based off the T51P and the Xelento from the original Xelento Remote wired IEM. The Amiron Wireless contains the same driver tech also found in the original Amiron Home wired edition. However, the Wireless edition is a closed headphone as opposed to open or semi-open. 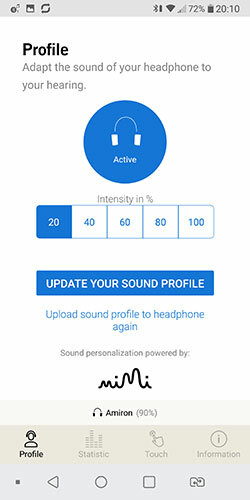 The MIY App, combined with beyerdynamic’s existing driver technology, is aimed at producing a class-leading piece of headgear for each key segment – in-ear, on-ear and circumaural (Amiron wireless). The use of an app is beyerdynamic’s holistic approach to managing key features remotely via an iOS and Android compatible app call MIY App. Features such as a touch-sensitive cup plate management and a special synching service tuned into your own listening capability. The Amiron Wireless offers AAC, SBC, aptX, aptX HD, and aptX LL as opposed to just regular aptX so it can go beyond pure audio applications into areas such as movies or gaming where sync delays are an issue. If you have heard aptX before aptX-HD is an upgrade in terms of clarity and dynamic range. Going aptX-HD will not reduce the level of compression but it will increase the BIT rate from 16BIT to 24BIT/48k. It is not on the same level as LDAC but hopefully upgradeable to aptX Adaptive which is the 24BIT/94k capable version including aptX LL coming out in 2019. Now Tesla is nothing new to beyerdynamic, it’s been used since way back on the T1 first gen but like the original Amiron Home beyerdynamic has used a similar dampened upgraded Tesla driver that they pitch as greatly diminishing unwanted vibrations and producing a better treble response. Unlike the Amiron Wired though the impedance is just 32Ω compared to 250Ω. This version has been tuned for the mobile phone and DAP user to fit in with the mobile pitch for the BT system so it is very easy to drive. In theory, the upgraded driver should respond in the same manner on the wireless version but you must remember, the Amiron Wireless version is a closed-back headphone so the tuning is going to be slightly different. The aesthetic of the Amiron Wireless is unmistakably beyerdynamic. This is a closed-back circumaural full-sized dynamic driver headphone with a form factor right out of the DT and original Amiron playbook. The Amiron wireless has a very solid build, angular arched metal gimbal design, well-padded headband, and circular cups. The color finish is flipped on the Amiron Wireless compared to the wired. Where it is darker on the wired, such as the cups, it now a lighter gray. Where the wired is lighter, such as the headband, it is darker on the wireless version. The materials used, however, seem to be similar including the hard plastic cups, a similar textured cloth to Alcantara on the headband/pads and the light silver metal for the gimbals. It is incredibly sturdy and weighs in at a hefty 380g but despite perceptions of an ultra-rigid design, it is fairly flexible as the picture below demonstrates. The changes? Instead of a wired open grill mesh on the front of the cups, the Amiron Wireless comes with a single smooth plate surface broken only by 4 little ridges, north, south, east and west on the right. This is your touch surface where the vast majority of controls are located including playback, codec, and phone controls. The left has no touch or control features. The cups are a little deeper than the Amiron Home wired edition in order to house the Bluetooth tech and integrated physical controls for pairing and power. There are also two venting ports to the read just above the gimbal hinges. 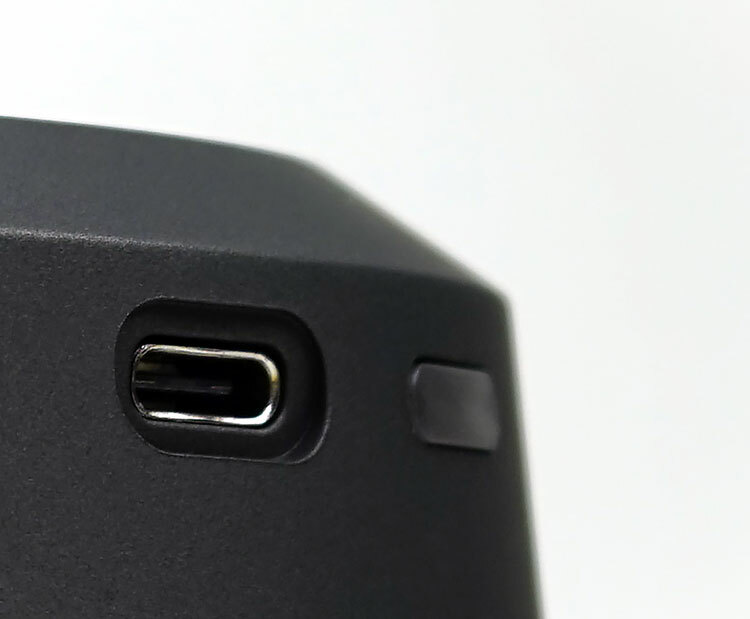 You have one flush power button to the side along with a USB-C charging port beside it. The flush button is a little tricky to use by the way. I would have preferred it slightly more raised as I miss it sometimes when trying to use it on my head. To the other side, you have a cable port. 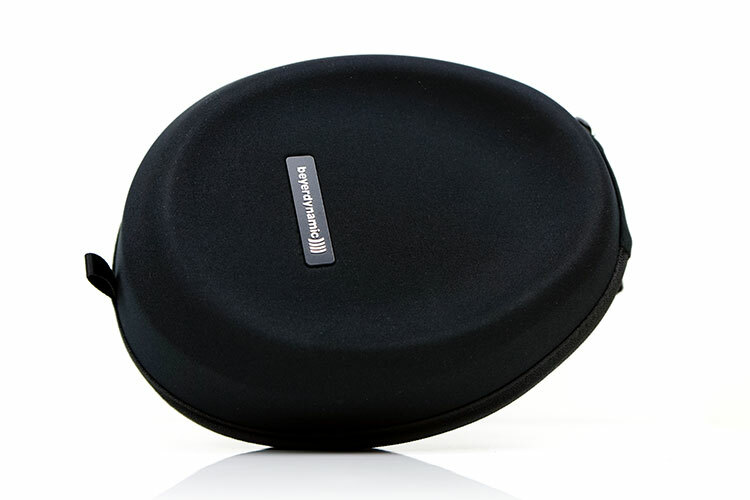 That’s right, the Amiron Wireless can be used as a wired closed back version of the Amiron open-back design. The best of both worlds for wired and wireless enthusiasts. It is, however, a single-sided (right cup) entry system as opposed to the Amiron Home dual entry and to facilitate the signal the Wireless has a wire per channel coming down to the cup from the headband. It is not as clean looking a finish as the wired edition but for ‘on the go’ use but it is a little easier to manage a single wire connection. The cable itself is a short 1.2 m, detachable, 4-pole mini stereo jack (3.5 mm) single-entry with a pressure-based lock rather than any ‘twist-and-turn’ system. The connecting jack is a 3-pole TRS gold-plated jack and fairly universal so it is possible you can cable roll the Amiron Wireless. 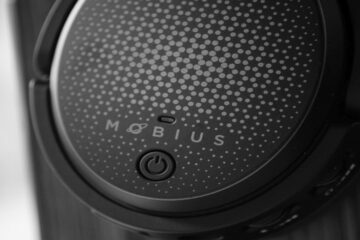 On the cable itself, you have a small in-line module for remote playback and mic operation so it is smartphone compatible. It is quite high up on the cable so you cannot physically see the module when operating it. Start memorizing! The materials used both on the headband and pads are the same as the wired version which means they are incredibly comfortable on the head. The headband uses a micro-velour material as opposed to the faux leather of the DT1770 and the micro-suede of the T70 headbands. They are less likely to flatten over time compared to the T70 pads. The ear pads are made from a soft Alcantara material but they are deeper than the older T series pads and more resistant to flattening or allowing the ear to touch the drivers. 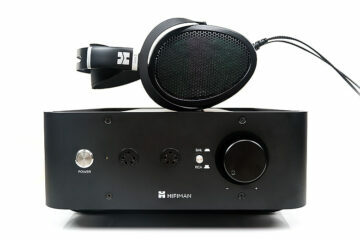 They also have a better foam filling and I believe one which Beyer favors for the low-end response over the older pads. Being a closed back the Amiron Wireless will isolate much better than the open-back wired version. 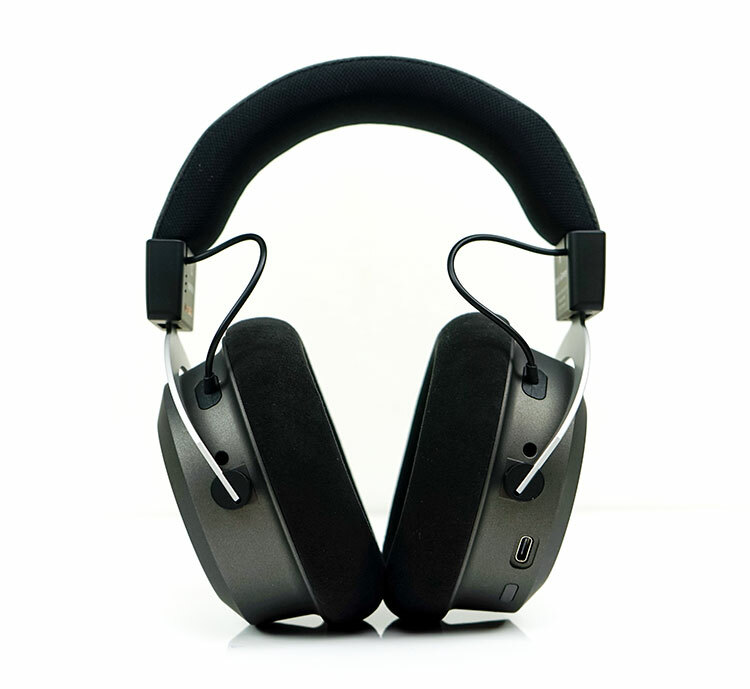 It is not passive AC like an IEM or ANC like some of the dedicated on-ear headphones in the market today but it will attenuate to a moderately good level. Compared to the DT1770 using the micro-fiber pads it does not isolate quite as well. I suspect the materials on the D1770 pads are a little less porous compared the Amiron Wireless and it also clamps a little stronger which may improve the seal. The right cup plate touch controls are a lot easier than I thought it would be. 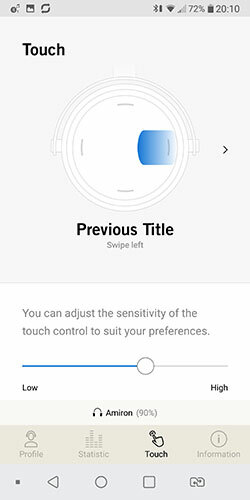 However, you do need to read the manual to get to grips with the myriad of touch gestures because they activate a wide range of controls on the Amiron Wireless. It covers everything from track selection, volume control, mute and phone call pickup as well as changing the actual codec you want to use. The generous level of space on the plate is what really helps in its usability. It seems fairly forgiving if you are slightly off angle in your motions which I generally am when moving “sight-unseen”. A simple swipe forward moves onto the next track and back to the previous rack with a swipe back. If you hold at the end of each swipe forward or back it will reverse or fast-forward the track you are playing. Volume control is a swipe up for higher and down for lower and a double tap will mute. I did find the volume increases and decreases to be fairly steady and not too quick to make you jump pu tof your seat. You can also control the level via your DAP or other BT source to a certain extent. The one slight difficulty I had was changing the codec from aptX to aptX-HD. For this, you have to hold the power button and swipe up. The flush button finish makes it challenging to find it, hold it down and swipe up at the same time without turning off the Amiron wireless accidentally. Maybe my fingers are not as mobile as I would like them to be but I would have preferred a raised button at the top for this. 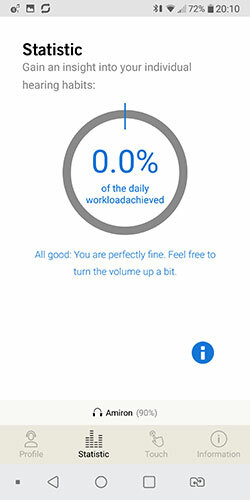 The MIY App is a very handy tool though judging by the Play Store reviews you would think it was broken. I was half expecting it to not work but work it did and no bugs when pairing the Amiron Wireless with my LG G6 using Oreo. Just make sure both the app and your stock BT connections are both paired or some of the features will not work. For example, the small start-up checker has a device initializer that will stall and freeze the app if you try to initialize when the Amiron Wireless is not connected to your BT source beforehand. 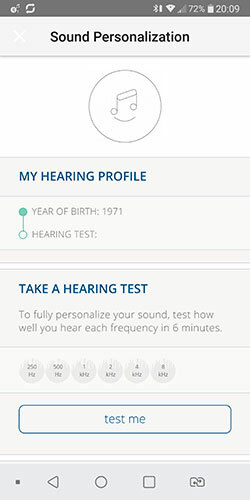 Once all hooked up the app will prompt you to set your hearing profile according to your age and encourage you also to take an unofficial hearing test from 250Hz to 8kHz. It is not an unreasonable scale and if your hearing is good you should be able to hear most of the test tones in a quiet environment at 50% volume. Having done all that it doesn’t show any outcome of the test. A bit sad on that since I would love to have known the outcome. It simply says you are all done and the headphones are set up based on the tests. You can apply the amount of custom EQ from the test in increments from the main screen of the MIY app but be warned, you cannot turn it off completely. Once setup you have access to a range of features, some very useful, some more interesting than useful. The most useful is the touch sensitivity control which allows you to adjust the level of pressure you need to apply when using the gesture system on the cup. It does work and very well at that. I found around 60% on the supplied scale to be the best compromise between accidental touching accidents and quick and easy swiping. Anything less I felt I was creating a visual to everyone else of awkwardly flirting with my cups. You also get an interesting statistic of how long you are actually listening to music as well as the Amiron Wireless battery life positioned at the bottom of the app screen. The info section gives you snippets such as the firmware and the headphones BT address. The rest really just tap into the web with features like the beyerdynamic store, Facebook etc. The battery life on the Amiron Wireless is excellent. The on-paper the supplied 1050mAh battery rating is 30 hours which naturally I did not get. If you choose to go full aptX-HD all the time, fiddle with the touch controls constantly and throw on the volume at loud levels the max you can expect is a little over 20 hours. I would say on average up to 25 hours mix and match. That is still rock-solid in terms of battery life for a BT headphone of this size and capability. As a point of comparison my Stance S1+ BT headphone is maxed out at 18 hours for its supplied battery and only by adding 2 AAA batteries can I get close to 25 hours on paper. In reality, it is a bit lower than that. 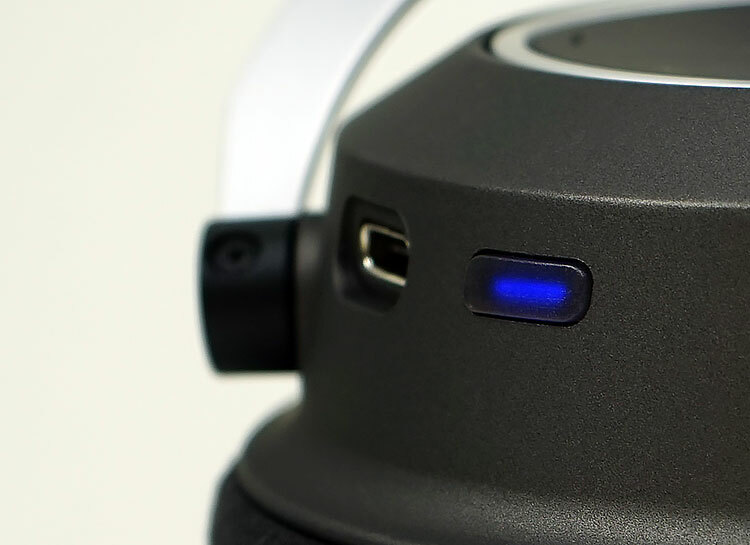 The Amiron Wireless also comes with a USB-C port for quick charging so you can slap it into a power bank on the go when the headphones run dry. The MIY App’s battery indicator is very useful since, unlike the Stance S1+, you cannot top it up on the go with disposable batteries. Critically, should you run out of battery the Amiron Wireless will still work as a regular full-sized headphone with the supplied 1.2m cable. It does not need to be turned on to work in that regard which is excellent. Packaging is similar to the Amiron Home experience though the box is a touch more colorful in its labeling. Inside though you get the new smaller and frankly better carry case from the Amiron Home along with some leaflet material, an essential guide, and the 1.2m cable. You also get a USB-A to a USB-C short charging cable. Unlike the DT series you only get one set of pads and not two different types (faux leather and velour). The only thing missing is an airline adapter which may be useful if you wanted to go wired on the plane. What about the Amiron vs the way more popular BTs by Bose and Sony?